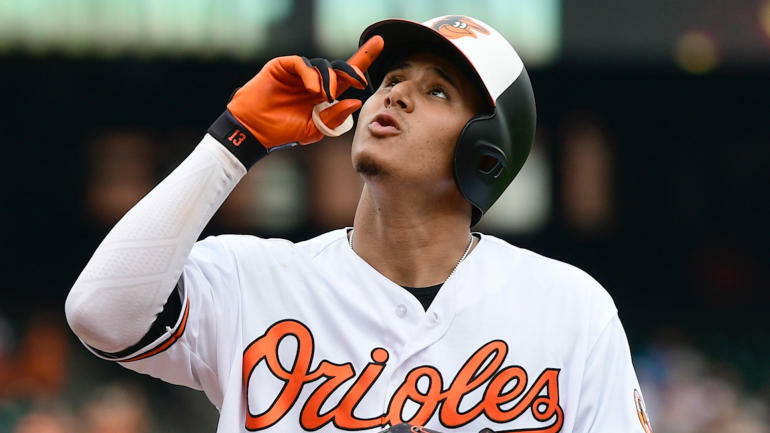 For the past day, the Baltimore Orioles trading shortstop Manny Machado to the Los Angeles Dodgers for a prospect package has felt like a fait accompli. The only thing that could stop the deal from happening before the regular season resumed was, well, an act of God — or, the joke went, Baltimore’s medical staff finding an issue with one of the players coming back. It looks for much of Wednesday like that joke may have grown into reality. But now things appear on track for Machado to join the Dodgers at any moment. More on the latest Machado trade rumors, as well as more buzz around the league as it happens, below. But first, get caught up on everything you need to know about trade season. First, you can read all about the key names likely to be available in the trade market, in the infield, the outfield, the rotation and the bullpen, depending on what your team needs. Then you can take a look at the top 25 prospects that rebuilding teams can target in trade talks. Finally, we’ve broken down what each potential playoff contender should be looking to do on the market, including the Astros, the Athletics, the Braves, the Brewers, the Cubs, the Diamondbacks, the Dodgers, the Giants, the Indians, the Mariners, the Nationals, the Phillies, the Red Sox, the Rockies and, last but not least, the Yankees. #Dodgers #Orioles should be able to officially complete Manny Machado trade this evening. 5 prospects led by Yusniel Diaz will head to #Orioles. Medicals no longer an issue according to a source involved in the transaction. It’s possible that the Orioles and Dodgers have found a workaround (the concerns reportedly were about one of the pitching prospects involved), be it by swapping out players or sweetening the deal with an additional player. Because terms of the proposed deal are not yet known, it’s possible the teams could turn to one of those fixes without anyone knowing any better. In the past, the Orioles have walked away from deals with Grant Balfour, Angel Pagan, and Tyler Colvin; they’ve restructured Yovani Gallardo’s contract; and they’ve rejected a trade that would have sent Zach Britton to the Houston Astros. (Those are just some of the stories.) It’s hard to blame the Orioles — why employ the doctors if you don’t trust their evaluation? — but Baltimore, more so than any other organization, has the reputation for being stingy in this arena. We’ll have to see how this plays out, but for now it looks like Machado-to-the-Dodgers is going to happen after all. According to Brendan Kuty of the Star-Ledger, the Giants are interested in acquiring Yankees prospect Albert Abreu in a potential trade. Kuty’s source went so far as to compare Abreu to Luis Severino, albeit with some couching. Abreu, who hasn’t pitched since late June, entered the season ranked as a top-100 prospect due to his raw arm strength. He’s spent the year in High-A, making 10 starts and posting a 4.28 ERA and 2.26 strikeout-to-walk ratio. Unfortunately, for the Giants, finding a match between the clubs is difficult. San Francisco isn’t in full sell mode, yet they do need to shed salary to remain underneath the competitive balance tax. Left-handed starter Derek Holland could make some sense, but it’s unlikely he’d be enough to net Abreu. Rays catcher Wilson Ramos is on the DL with a hamstring strain, and as Marc Topkin tweets, he’s expected to be sidelined well beyond the July 31 non-waiver trade deadline. That’s significant because Ramos is a potential trade chip for the Rays. This season, he’s batting a highly productive .297/.346/.488 (133 OPS+) with 14 home runs in 78 games. As well, Ramos in his first full season back from ACL surgery has worked more than 600 defensive innings behind the plate. Ramos has been linked in trade rumors to teams like the Astros and Nationals. Now, though, all of that is complicated by the catcher’s injury. Trades in August are still possible, of course, but players must first pass through revocable waivers. In other words, it’s now going to be more difficult for the Rays to trade Ramos, who’s in his walk year, in exchange for prospects. The Rangers are entering the deadline as sellers and have a few interesting pieces to move — namely left-handed starter Cole Hamels and third baseman Adrian Beltre. What will Texas want in return? Young arms, per MLB.com’s T.R. Sullivan. Sullivan notes that the Rangers have had rotten luck in keeping their top pitching prospects healthy. Add in how Texas has few, if any long-term fits in its big-league rotation, and it makes sense that Jon Daniels would ask for some starters in return for Hamels and Beltre. It also could make the Yankees and Phillies — each with young arms to spare — optimal trade partners. Rick Pitino continues to insist he's innocent in his new book, but is he changing anybody's mind?